Sunflower Suzie was sitting on a bench in the garden. It was a cool autumn day. The wind was blowing. Leaves were falling from the oak and maple trees. Animals were scurrying around trying to get ready for winter. “Aren’t you cold?” asked Sunflower Suzie’s husband, George, who was cleaning up the yard. Sunflower Suzie woke up one morning to find out that she had turned into a real live sunflower. At first she was having a hard time dealing with it but as time went on, she learned to accept who she was and she was actually starting to love herself. George sat down on the bench beside his wife. The two sat and watched as a chipmunk scurried around the ground, looking for acorns. Sunflower Suzie smiled. “Now that is nice to see,” said George. “What is?” asked Sunflower Suzie. “It has been a hard adjustment for me,” said Sunflower Suzie. It is important to love yourself. 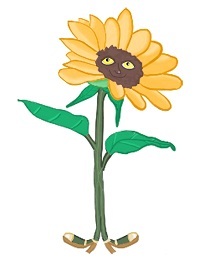 Example: Sunflower Suzie had a hard time adjusting to the fact that she was now a live sunflower but she learned to love herself and accept herself. This entry was posted in Autumn Stories, Autumn Story Challenge 2017, Grade 3 Level, Sunflower Suzie Stories and tagged garden, happy, happy place, smile, sunflower, sunflower suzie, Sunflower Suzie is in a Happy Place. Bookmark the permalink.